We’d love your help. Let us know what’s wrong with this preview of America in World War I by Donald M. Goldstein. To ask other readers questions about America in World War I, please sign up. Donald M. Goldstein, Ph.D. (University of Denver) is a retired Air Force officer who served for 22 years. He is currently a Professor of Public and International Affairs at the Graduate School of Public and International Affairs at the University of Pittsburgh. Dr. Goldstein is author or co-author of over 50 articles and 21 books. 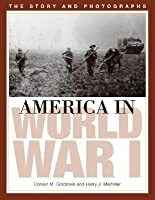 His most famous is At Dawn We Slept: The Untold Story of Pearl Harbo Donald M. Goldstein, Ph.D. (University of Denver) is a retired Air Force officer who served for 22 years. He is currently a Professor of Public and International Affairs at the Graduate School of Public and International Affairs at the University of Pittsburgh. Dr. Goldstein is author or co-author of over 50 articles and 21 books. His most famous is At Dawn We Slept: The Untold Story of Pearl Harbor, which is in its 20th printing. The book was first runner-up for the Pulitzer Prize in 1982 and was on the New York Times bestseller list for 47 weeks. His book, Miracle at Midway, was on the bestseller lists for 9 weeks. Averaging over 200 talks a year to radio, TV and civic organizations, Dr. Goldstein has been awarded two Peabody awards for work on Pearl Harbor: Two Hours that Changed the World with David Brinkley (ABC), and D-Day: A Soldier's Story with Peter Jennings (ABC). In addition to his Ph.D. from the University of Denver, Dr. Goldstein holds a Bachelor of Arts, three masters degrees and is a graduate of the Air Command and Staff College and the Air War College. He is a consultant for ABC, NBC, NHK, the Discovery Channel, A&E, the History Channel, and the Disney Channel. He is married with four children. He and his wife, Mariann, reside in Upper St. Clair, PA.